Because mothers (and fathers) learn as much as they teach! A tiny robot with a great big personality, along with my not-so-little third grader, taught me something new and exciting over the past two weeks: Tech can be FUN! Who knew!?! Our first week of third grade coincided perfectly with the arrival of Ozobot, a small robot I was asked to review through Tryazon. I was SOOO EXCITED to receive this package, like really, REALLY excited! I basically knew nothing about coding. However, I understand the importance of technology and want to do my very best to help my little guy learn about the world around him. And, tech is a huge part of this. 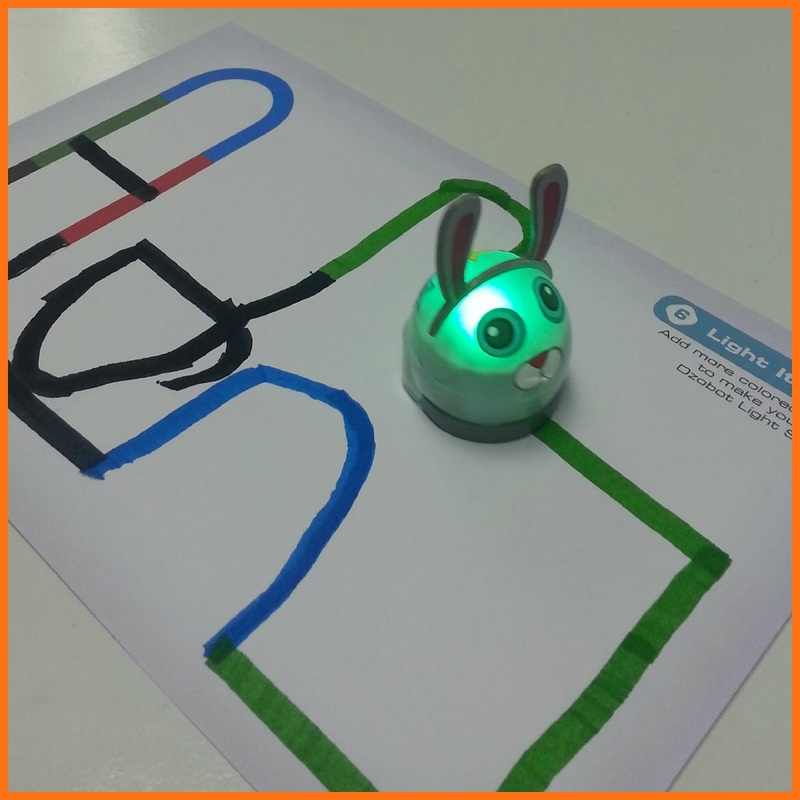 After checking out the Ozobot.com website, I was thrilled to start learning with our new friend. You see, the website states, "Empower your child to embrace the future and become a maker of technology, not just a user. Computer science is child's play as adventures, games and codes become as easy as laughter, when your child connects with their own power of creation." Doesn't that sound amazing? Fun and Games: Learning At Its Best! Now, please believe me, we don't always have fun in the LML household. We're just an average family, and some days are definitely better than others. But, I can tell you this with certainty: when it comes to our homeschool learning time, games make everything more fun. I was recently invited to host a game night and review three RoosterFin games through Tryazon.com. These games are advertised as “educational,” so I couldn't wait to get them into our classroom. The big box of fun arrived just in time for our last week of second grade. Woo-hoo! This mama was relieved to have some new educational fun to round out the school year. MonkeysUp was by far our favorite. It mixes strategy with math...and a bit of luck. 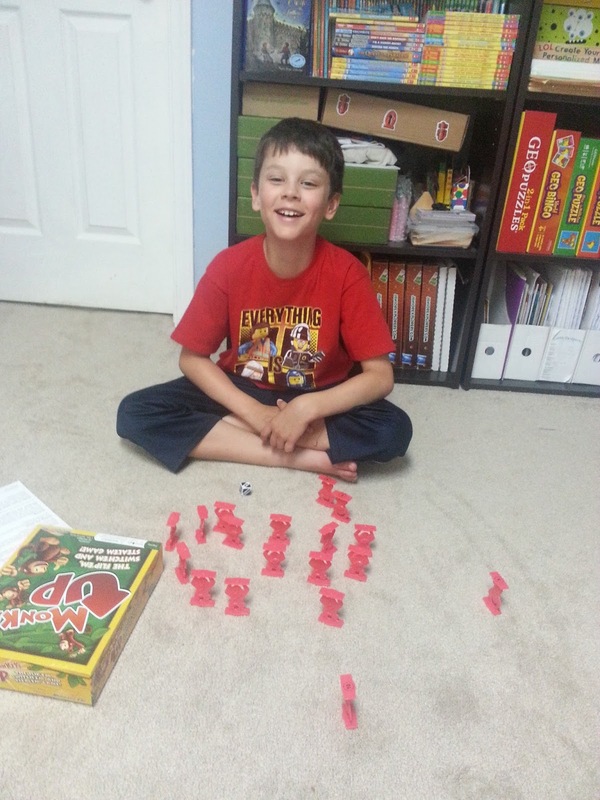 My not-so-little-anymore Bug had a blast with “the flip'em, switch'em and steal'em game.” Monkeys Up comes with eighteen red, plastic monkey figures, all with a number or “x” printed on the bottom. Players take turns rolling the die, then switch, flip, or steal a cute, little monkey. The game ends when any player has three of their monkeys number side up. Just add up your monkey's numbers. The player with the highest total wins. Guess who else wins.....ME! I win! I don't have to worry about moans and complaints over the day's math lesson. And, I don't have to work on a complicated lesson plan. 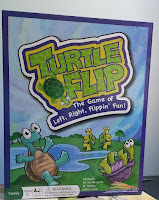 I just pull out the box, say “let's play,” and enjoy a simple, fun, and educational game. Bug and I had a great time playing per the instructions, but I plan to modify this game as well. With a few changes to how we play, the game will be used to review not only addition, but subtraction and multiplication. I am pleasantly surprised about how excited I am to have Monkeys Up in our classroom. As for the other two RoosterFin games we received, they're nice. 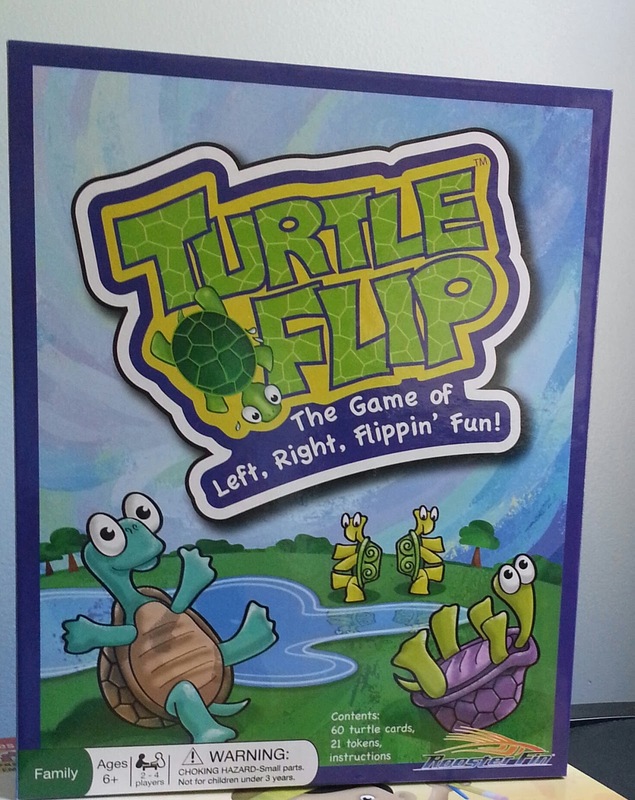 TurtleFlip is a cute game that helps teach directional skills (left/right) and number recognition. Although the game is advertised as two to four players, I recommend having at least three to help younger players understand which way is left and which is right. If you only have two players available, maybe you could ask a few stuffed animal friends to join the game. 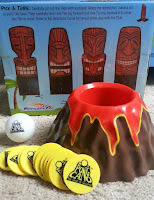 PongCano was also loads of fun, but not something we will keep in the classroom as an educational resource. It is labeled as “The Game of Sacrifice,” but it definitely is no sacrifice to play. The goal is to bounce a ping pong like ball into the top of a three inch high plastic volcano. If you miss, you drop one of your “gold coins” (sturdy plastic chips) into the volcano. Make the shot and you get to empty the volcano. The game ends when one player has all twelve coins. Easy peasy! PongCano had us erupting with laughter, and Bug has requested to play many times. I can see this game becoming a big hit at our large get togethers as many people can play at once, and laughter seems a given. I'd love to know what games your family enjoys! Are they specifically educational, or just a great way to spend some fun quality time? Please let me know in the comments below. Happy gaming!!! I received these products for free, in exchange for an honest, unbiased review. All opinions are my own. Affiliate links may be present in the above post. Rest assured, I will always give my honest opinion and only recommend products and services my family and I would happily use ourselves. It seems that in the USA one of the most controversial holidays is Columbus Day. I personally think it is important to study (not glorify) as many aspects of history as we can. This is why I choose to teach the facts (as best we know them) about individuals such as Christopher Columbus. As best I can tell, Columbus was a driven, intelligent and cruel man. Yet, he did make a significant contribution to the world. His voyages laid the ground work for what is now the Americas. Of course, indigenous peoples lived here long before 1492 when Columbus sailed the ocean blue. He was not the first to sail across the Atlantic, and it seems he did not know he "discovered" a New World when he died. On this Columbus Day we are concentrating on studying who this historical figure was, why his contributions were significant, how he made his voyages, what animals he may have come across, and what we can learn from his actions both positive and negative. Since my little man is in kindergarten we are keeping the learning fun and entertaining while still making note of the negatives, such as slavery and unnecessary deaths. Throughout this week we will learn about Columbus and related topics through books, science experiments, writing assignments, educational videos, etc. Here is a glimpse at what we have and will be doing. Young Christopher Columbus is a great First-Start Biography from Scholastic. It offers a quick look into the explorer's early life and is a great way to introduce the idea of biographies to young children. 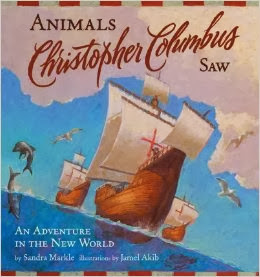 Animals Christopher Columbus Saw By Sandra Markle offers readers a chance to explore the wildlife Columbus and his crew may have seen during their journeys. Some of the animals may surprise you. Have you ever heard of Shipworms? 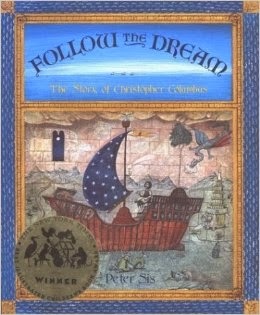 Follow the Dream by Peter Sis is a simple and beautifully illustrated book about the early life and first transatlantic voyage of Columbus concluding at the point he first reached the New World. Although not necessarily a good read-aloud book for small children, The Nina, The Pinta, and The Santa Maria by Dennis Brindell Fradin might be a good choice for the older set. It offers an in depth look at the famous ships, Columbus and the not-so-good aspects of the story. I found multiple excepts to read with Bry and many illustrations he enjoyed. In addition to these interesting books, Bry and I will be adding Columbus' 1492 discovery to our on going time line, discussing boats and experimenting with sink vs. float, and talking about the influences of these explorers and others. This will be a perfect introduction to Marco Polo and the role he played in history. Keep an eye out for our review of the Marco Polo Man & Myth exhibit now on display at Fernbank Museum of Natural History in Atlanta, Ga.
As a mother I am constantly learning something new. At times it is a creative, kid-friendly recipe, perhaps an explanation of some scientific phenomena, or even something simple like a better way to accomplish a housekeeping task. Recently I had the opportunity to try a new-to-me laundry product through a "Sample & Share" from Crowtap.com (Look for more about CrowdTap soon). This particular sample was of Woolite Everyday. 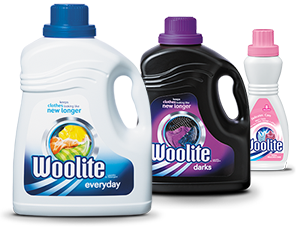 You may know Woolite as the "delicates" brand, but they are quickly expanding into the everyday laundry market. I have found Woolite Everyday to be a great alternative to my regular brand. In fact, I liked the results of using my free sample so much that I went out and bought a bottle. To date I have done only a handful of everyday loads with this detergent and I can tell you the clothes come out clean, soft, and with just a hint of a very simple, fresh scent. The Woolite brand website claims, "Woolite® Everyday gives all your clothes the right balance of cleaning and caring. It doesn't contain harsh ingredients, so it won't cause stretching, shrinking or fading. With Woolite® Everyday, you can keep all your clothes looking like new!" I haven't used this particular product long enough to validate this claim, but I do like the results I am seeing so far. Part of the great "Sample & Share" pack I received from CrowdTap.com. What I can tell you for sure is that you should definitely consider trying Woolite (again if it has been awhile). As I mentioned before I received my free sample through CrowdTap.com. I was also part of another Woolite sampling a few months ago through the same program that allowed me to try Woolite Darks. Now that stuff will totally change the way you look at your laundry. After the first wash using the Darks formula I was hooked! I saw such a noticeable difference in my dark clothes. Many of the pieces looked and felt better than brand new. The detergent seemed to erase the look of fading. In fact I liked the product so much it is now all I use for my dark clothes. I will admit Woolite is a bit more pricey than other brands, but if it keeps clothes looking better longer it is worth the extra cost in my opinion. Do you have a product you love? Please feel free to share it with me in the comments below. I love learning about new things, and I am always open to suggestions. I Wish You Happy Laundry Days!!! Although I received free samples of Woolite Everyday for myself and a few friends through Crowdtap.com, this review was written by choice. All opinions are my own and no other compensation was received. I just like sharing the great products and services I am lucky enough to come across.